To book, we only require a per-person deposit, which you can pay with your credit card or PayPal account. This deposit will be applied towards the cost of your package, and is generally non-refundable. The balance is due 105 days prior to departure (or within 72 hours, if you're booking less than 105 days prior to departure), and can be paid by credit card, PayPal, check or money order. $500 Instant Savings. Expires May 23, 2019. * All prices reflect savings. What to Expect This fast-paced, locally hosted tour involves a significant amount of walking or hiking, often on uneven terrain, and reaches high altitudes requiring a high level of physical fitness to fully enjoy the trip. This tour also includes long scenic drives between destinations and may have limited rest stops. 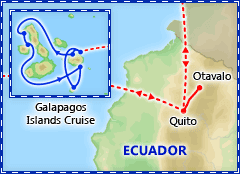 The Galapagos cruise portion of the tour may have up to 90 passengers on board. Discover the wonders of Ecuador & the Galapagos Islands, a remarkable collection of landscapes, people, cultures, animals, plants, and more. 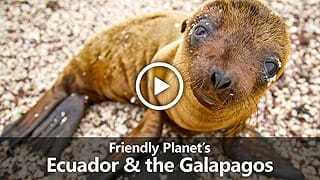 Our Ecuador & Galapagos Islands tour covers the highlights of this incredibly diverse country. You'll visit the capital city and UNESCO World Heritage Center of Quito and the colorful and bustling Otavalo market. 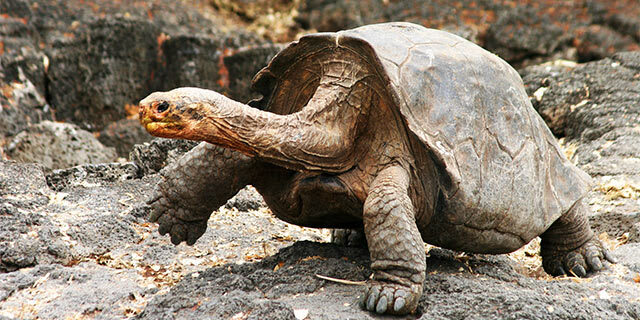 Round out your tour with a guided cruise through the Galapagos Islands, the magical place that inspired Charles Darwin to propose his theory of evolution. All of this, plus airfare from Miami, is yours for an incredible price. We're excited about this tour and we know you will be too, but don't wait too long to book, as space is sure to sell out quickly! Instant Savings: Get $500 off if you book by May 23, 2019! If you want a few extra days to explore on your own, we may be able to arrange for you to stay later than the scheduled dates, including extra hotel nights and separate airport transfers, for an additional charge. Ask us about prices and availability when you reserve. More information Want to extend your trip? 1. Cabin upgrades are subject to availability. We will confirm your cabin selection usually within 1 business day of your reservation. If the category you selected is unavailable, you'll have the option to select a different category (at the prices shown) or cancel your reservation and receive a refund of your deposit. This package includes round-trip flights from the city listed above. Accommodations: 2 nights Hilton Colon, Quito. Full Day Itinerary: Today, enjoy a panoramic city tour of Quito. Arguably one of the loveliest of all South American cities, Quito enjoys a spectacular setting surrounded by mountains and several snow-capped volcanoes, including the still-active Mt. Pichincha. Begin your walking tour at Independence Plaza, flanked by the Cathedral, Presidential Palace, Municipal Building and the Archbishops’ Palace. The next stop, La Compañía de Jesús, has an ornate and richly sculptured facade and interior, with colored columns, 10-sided altars, and gilded balconies. Continue to the Monastery of San Francisco, Quito's oldest church and the largest colonial building constructed in Latin America. Accommodations: 4 nights Santa Cruz II. Included meals: Breakfast, lunch & dinner. Full Day Itinerary: Transfer to the airport for your flight to Baltra Island, gateway to the Galapagos Islands to begin your adventure. Upon arrival, transfer to the dock to board your cruise ship, the Santa Cruz II, your home for the next 4 nights. Settle into your cabin, and enjoy an introductory briefing and lunch. In the afternoon, arrive at Santa Cruz Island. The north shore of Santa Cruz hosts the fascinating landscapes of Dragon Hill. The first part of a walk passes a brackish-water lagoon frequented by shorebirds, ducks and flamingos, while further inland, the trail offers a beautiful view of the bay and the western islands of the archipelago, as well as the chance of observing land iguanas. 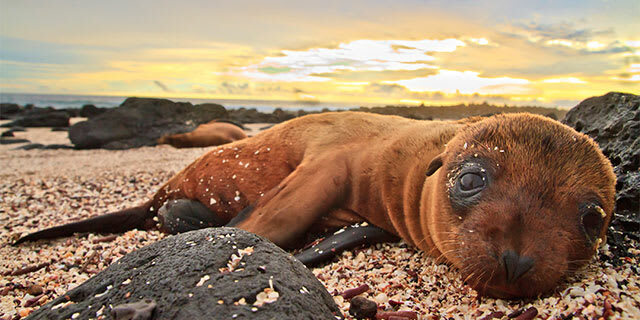 Full Day Itinerary: After breakfast, explore the coast of Isabela Island by panga, while the naturalist guide explains the dramatic geology of the area, a nesting place for several Galapagos highlights: flightless cormorants, Galapagos penguins, fur seals, and boobies. Depending on weather conditions, snorkel or swim along the cliffs of this area rich in marine life, seasonally-visited by green sea turtles and oceanic sun fish. Full Day Itinerary: In the morning, disembark (dry landing followed by a brief bus ride) for a visit to the Charles Darwin Research Station’s giant tortoise breeding center within an impressive giant prickly-pear cactus forest, home to many land birds. These are the headquarters of scientific investigation, conservation and the National Park administration. Following the visit, board a transport to enjoy lunch in the cooler highlands of Santa Cruz Island, a completely different ecosystem. There are several options available for the afternoon, which can be discussed in advance with your Expedition Leader. Options include beach walks, kayaks, walks along the tortoise reserve, etc. At the end of the afternoon’s activities, return to Puerto Ayora and embark on the Santa Cruz II. Full Day Itinerary: After breakfast, enjoy a panga ride along the maze of channels on Floreana’s north shore. Continue to Baroness Cove with its breathtaking views of Floreana. Land at Post Office Bay to visit the historic barrel that has served as a post office in the archipelago for over two centuries and where postcards are traditionally left for guests from other vessels to hand-deliver to their destinations. Head back on board for lunch. Following lunch and a siesta, take a panga or glass-bottom boat to explore the underwater wonders around Champion Islet, an extinct shield volcano, regarded as one of the best snorkeling spots in the archipelago. From there, it’s on to Punta Cormorant, beginning with a wet landing on the beach for an easy walk that includes a brackish-water lagoon where bird species such as American flamingos, pintail ducks, common stilts, herons, sandpipers, and others gather. Continue the walk over to a white-sand beach, where sea turtles emerge from the sea at night to nest (from December to May). Accommodations: 2 nights Hilton Colon, Quito. Included meals: Breakfast & dinner. Full Day Itinerary: Disembark and transfer to the airport to take your flight back to the mainland. Upon arrival, you will be met and transferred to your hotel. After some time to relax, enjoy a farewell dinner at a local restaurant. Full Day Itinerary: This morning, set out on the Pan-American Highway to Otavalo. After driving through dramatic Andean scenery, arrive at the famous indigenous fair and the textile market of Otavalo. Enjoy a visit to the charming Otovalo Market, showcasing brightly colored and unique handicrafts. Stroll by their many stalls filled with paintings, woven ponchos, scarves and blankets. You'll also see traditional hats, handbags, beaded jewelry and more. Try your hand at bargaining for something special to bring home, or just enjoy people watching in this bustling and historic environment. Then proceed to Peguche, a nearby indigenous village, where local artisans weave in their homes. Learn about their culture and everyday life. Next, have lunch in one of the charming country inns or haciendas of the area. Dry landing: guests step from a dinghy onto rocks or a dock. Wet landing: as a dinghy edges onto a sandy beach, guests step into knee-deep water and wade ashore. The Hilton Colon Quito is located in the heart of the Mariscal district, on Quito's bustling Avenida Amazonas. It is also only 30 minutes away from the airport and 15 minutes away from the historic quarter. 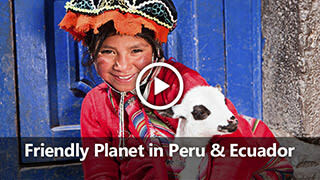 What should I know about Ecuador? Check out our guide for travel tips, the best time to go, blog posts, videos, and more. 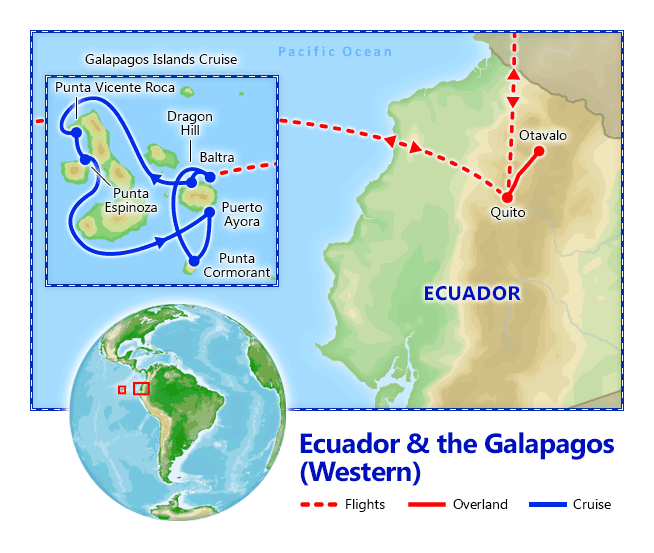 What should I know about Galapagos? Check out our guide for travel tips, the best time to go, blog posts, videos, and more.